We report on casting news for season 2 of “True Detective” Colin Farrell and Vince Vaughn appear to be good choices. The new season appears to be a long way off though. 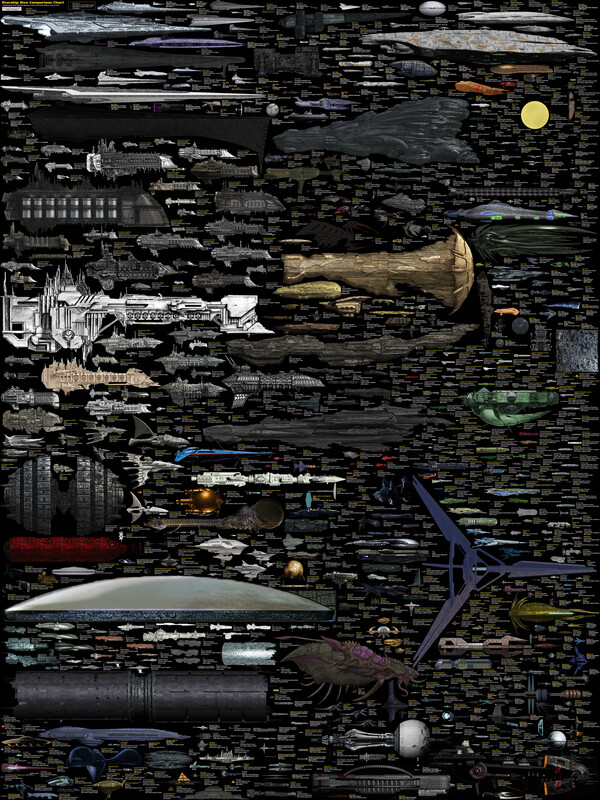 We geek out over a Starship Size comparison chart. We name our favorites. Check out the link and let us know your favorite. The Capaldi Era of “Doctor Who” seems to be improving. Patrick is concerned he is getting sub-par material to work with. Andrew reads “Batman Eternal” and “Invincible” and is disappointed in the ending of the latest Emberverse novel. Chris reads many things. His interest in the “Powder Mage” triology has been increased due to a recent plot development. Patrick prompts a discussion on the glut of movies based on YA novels as he has seen so many YA movies lately. “DESTINY”! Andrew plays the game on his own and has fun! Chris and Patrick are proud. Chris continues to love “Diablo”, the latest patch makes him happy. Andrew almost hangs himself from disinterest. This entry was posted in Podcasts on September 26, 2014 by BrothersGeekadmin. We report on the Apple announcement of the Iphone6, 6Plus and Apple Watch. We establish Christopher likes batteries. “The Leftovers” Season 1 Finale delivers on multiple levels. Storytelling at its finest. It brings all the Feels. Andrew is re-watching “Arrow” Season 1 with his lady. She probably has a thing for Stephen Amell. Christopher and Patrick discuss most recent “Doctor Who”. Mixed feelings all around. While reading “Ready Player One” Patrick reflects on his own gamer experience. We feel this is a good thing. Andrew reads the newest book in the Emberverse series. Its good adventure. Reviews are good to great, Andrew has no idea what he is doing. Just likes shooting stuff. Chris and Patrick have more nuanced reactions. This entry was posted in Podcasts and tagged Destiny, Doctor Who, Iphone 6, The leftovers on September 12, 2014 by BrothersGeekadmin. We report on The Rock’s casting as Black Adam in the upcoming “Shazam” film from the DC Cinematic Universe. We all discuss “The Desolation of Smaug” It’s bloated and silly but Benedict Cumberbatch as the voice of Smaug is fantastic and the Dragon himself is amazing. Chris discusses “Homeland”, we all recall our love of “Band of Brothers”. Batman Eternal #22 and the series as a whole is discussed. Andrew reads a NON YA book. “The Queen of the Tearling”. Patrick finishes “A Feast For Crows”. He is spent. Christopher kicks Andrew’s tail in “Mario Kart 8”. Andrew needs more track time. Patrick and Christopher play “Diablo” for the Xbox360 and PC respectively. Their love for the game is strong and not at all excessive. Destiny arrives on 9-9-2014 All rejoice. Both brothers undershoot the actual number. This entry was posted in Podcasts on September 4, 2014 by BrothersGeekadmin. Patrick and His friend Lloyd play some check it out! This entry was posted in PLAYED and tagged Diablo 3, Xbox 360 on September 4, 2014 by BrothersGeekadmin.